I already wrote about the smallest QWERTY keyboard EFO Google TV Mini keyboard which was design to make HTPC control easier and handier. Recently EFO released a next generation of its keyboard – EFO Air mouse. I bought it and used enough to give some feedback. First of all, the quality of the keyboard is very good. New battery allows using it almost for month and can be fully charged from laptop USB during one hour. As you may see on the picture, the EFO Air mouse doesn’t have a touchpad anymore. Instead of that it sports gyration mouse. It’s really cool but I have some troubles with it when I need a point it to specific menu item in XBMC and press left or right button using one hand. In my experience Gyration remote control is handier then it. Useful addition to good battery and flying mouse is IR transmitter. It has a few buttons on the back side of the keyboard and supports two devices. So, using the EFO Air mouse you may control your HTPC by RF and TV and/or AV received or satellite box by IR, which is quite good for forty dollars. Finally Insteon is coming to Europe! Almost four years ago it was announced plans to bring Insteon devices to Europe. But only now those plans become a reality. Joe Dada, SmartLabs / Smarthome owner, confirmed the European spec Insteon units are already in use on trials and they will ship in 2012! 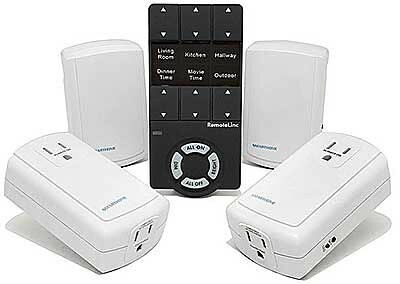 Both types will be available – powerline and RF. Very good news for all X10 owners because Insteon is compatible with that old home automation technology and can be used together with X10 devices. Currently the most interesting question is about the price of European Insteon devices. Will it bit Z-Wave we see very soon I hope. Recently I received to my mailbox a link to a very interesting remote control called PC-TV All in One. It has both IR and RF. IR is used to control TV while RF is needed to send commands to HTPC. 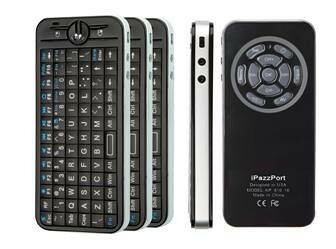 Except navigation, numeric and playback hard keys, the remote control sports QWERTY keyboard and 360-degree Jog-ball mouse control. Not bad for thirty four bucks device. 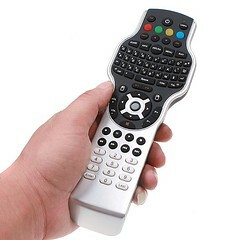 The PC-TV All in One remote control will be ideal if you use just TV and HTPC with XBMC, Boxee, PLEX or LinuxMCE. It’ll make navigation through media library or online services. However if you have additionally cable box or AV receiver then you should find something else. Because PC-TV All in One supports only two devices. Also not sure then Jog-ball is good to control mouse. I use similar one in the iMON remote and would like to say the Gyration remote is much more handy. But the QWERTY keyboard is a big advantage. so, take it into account. 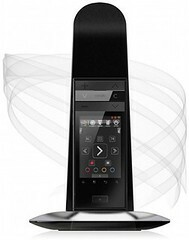 Conspin recently introduced its new smart remote control called ANDI-ONE. It’s based on Android 2.1 (Eclair), supports IR, RF and WiFi and allows to control up to 50 devices! The ANDI-ONE sports a 3.5 inch (320*480) LCD display to display different remote control layouts as well as Android’s applications like a photo frame, the watch, weather information, headline news etc. Moreover, it can playback media content to a TV via HDMI and makes VoIP calls thanks built-in microphone and speakers. Additionally the remote control has three-axis accelerometer. So, it can be used as a spatial mouse. The ANDI-ONE battery can be charged via PC/notebook USB port or using stylish dock. The full charge allows to use it for 20 hours. Currently there is no any information about availability or price of Conspin ANDI-ONE. Hope it won’t take too much time for producer to bring that fantastic device on the market. 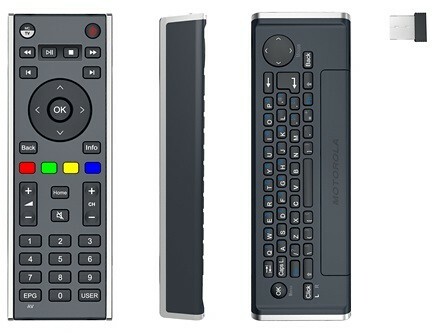 Pulse-Eight, offered HTPC based on XBMC, announced selling of the Motorola NYXboard remote control on their web site. The $59.99 device has QWERTY keyboard on its back side. Plus it supports both RF and IR. So, you’ll able to control all your IR-based AV equipment and will navigate easily through media libraries or online services.